After 14 years as marketing chief at Toyota Australia, seven years as an account director at one of Australia's biggest ad agencies, two years in the real world of retail and seven years with Ford Asia Pacific, Prof. Bob Miller brings a vast range of experience and lateral thinking to benefit his students. During his tenure as General Manager-Marketing, Toyota Australia achieved outright market leadership for four consecutive years. Most Australians are familiar with his 20year-running Toyota theme "Oh, What a Feeling!" Millions laughed at the antics of Prof. Miller's whacky Camry Chicken as it failed year after year, to be the "chicken that crossed the road". He launched Australia's Lexus luxury car franchise in 1991. 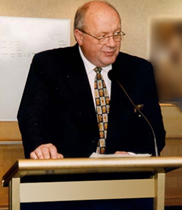 In October 1996, Bob established his marketing consultancy, Australia Street Consulting Pty Limited in Sydney. Bob successfully advised an ever-growing number of ad agencies and national corporate marketing Facultys on the best way to earn a return on their marketing investments. Prof. Miller drafted the Sydney Olympics and Paralympics Plans for Telstra Australia and for Samsung Electronics. He is an acknowledged agent of structural change. As three times President of AANA (Association of Australian National Advertisers), Bob was instrumental in changing forever the structure of advertising as a whole, when he led the charge to do away with the industry's long-standing ad agency accreditation system. In 2000, he advised the NSW Department of Education & Training on an historic change to the format of its senior secondary education system in a world-first change to the future of government/automotive industry co-operation. Last Updated: 2013-04-23 13:56:11 by Emily Inglis .